After a busy Christmas season and getting settled into my new flat I finally got the time to do a proper bit of cooking this weekend. Making bread is a little messy but every time I make it I ask myself why I ever bother to buy it as it’s so easy to make, tastes great and there is a strangely satisfying feeling of seeing it rise. One of the beauties of making your own bread is that you can put whatever you want in it. From cheese, olives, seeds to lardons. Add your yeast, warm water and sugar in a bowl and leave for 10 minutes. In a pan fry the onions until they are golden. For the dough, in a bowl add the flour and make a little well. In the well add the yeast mixture, onions, olives, rosemary, salt and pepper. Gradually incorporate the flour into the well and mix until it becomes dough. Add more water or flour as necessary (the dough should not be sticky but elastic). Place the dough on a clean floured surface and knead for about 5 minutes. Place the dough into a large bowl and cover with a damp cloth and leave to rise for 2 hours in a warm place. After the two hours knead for about a minute and shape into a flattish round shape. Place the dough on a greased baking sheet/ tray. With a knife make criss-cross cuts into the top of the dough and cover the dough for another 30 minutes. Heat the oven to 220C. Dust the top of the dough with a little flour and place the dough in the oven for 10 minutes. Then lower the heat to 200C and continue cooking 20 minutes. The loaf should sound hollow and have a golden crust. You can eat it warm or cold. I had some for my breakfast with some smoked salmon, yum! 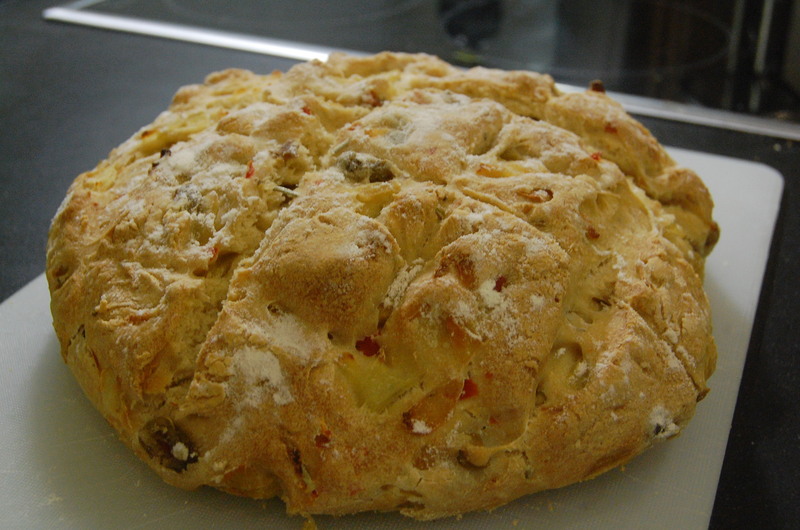 sounds good, I have been making a similar one with a more ciabatta feel because I had a big spoon ofolive oil in it.